I got into jailhouse bodybuilding right away, joining a court and acquiring weightlifting gloves from a man in wheelchair. That was the only way to get them; the gloves are issued only to wheelchair-bound inmates, who then flip them for a nice profit. There were other paraphernalia. Straps for the slippery pig-iron bars, for instance. Guys would sew them out of canvas belts and sell them for a pack of cigarettes. The price was low because the cops took them away all the time. Then there was the belt, which was a jailhouse bodybuilder’s very identity. Leatherworking was allowed in Green Haven CF, so for $50, a man would make a weightlifting belt that expressed your personality. In truth, they weren’t even that comfortable. The best one I ever used was a jury-rigged canvas belt sewn out of a punching bag’s exterior, with the word “Everlast” still visible. But every serious weightlifter I knew had his own personalized belt. I saw one that said “Silverback” in calligraphy, with a stylized gorilla face. Others had the images of Hitler, or dice, or gang images, or various kinds of ethnic signifiers. I saw Polish flags, Trinidadian flags, Chinese flags, Thai flags. American prison is a melting pot, too. I decided that this was the way to go. I designed my belt with the old double-headed eagle of imperial Russia and an oxblood-and-black color scheme, and submitted it to Mafia along with a smuggled-in $50. Mafia was a prisoner who had done 22 years at that point and had never cut his hair. He spent hours braiding it in the morning before working on my belt. Once I received it, I wore it for every exercise. It’s part of the culture, especially since prisoners are so limited in what they can wear. In an environment where your self-expression is constantly denied, you seize any opportunity to assert who you are, even if it’s only a bit of colorful leather wrapped around the waist. Wearing the belt for squats, with my wheelchair gloves and my sewn canvas straps, made sense, but I wore it to do forearms as well. It was just part of the uniform of a jailhouse bodybuilder. Guys manage to get themselves in good shape inside, even with all the primitive equipment. Nutrition is a problem, of course, as any bodybuilder knows that feeding the muscle is half the battle. Getting enough protein is a struggle for every incarcerated weightlifter, so now there’s a whole racket in which people steal cases of whitefish out of prison warehouses and sell them to inmates. There are other methods. In New York State, prisoners with AIDS are issued cases of Ensure, a drink that provides massive doses of nutrients. While the stuff actually has a bunch of calories and not as much protein as one might think, it’s also chock-full of vitamins and minerals. Naturally, the Ensure gets sold to the bodybuilders. On the inside, where people tend not to know all that much about body chemistry, vitamins are regarded as an almost magical product with mysterious powers. Many guys won’t even start a workout regime without a supply of them. In truth, the prison menu is designed by a professional nutritionist and contains all your dietary necessities. The massive doses of vitamins E and C and B-12 that prisoners steal and smuggle only make for expensive urine. Getting the protein required was an exercise in theft and smuggling. The prison commissary sold protein powder and amino acids and vitamins, but this was hardly enough, especially after reading the ads in Flex magazine, which has a devoted readership inside. One guy I knew ate Tums by the roll, for the magnesium. Creatine is an entire industry: A few prisons in New York State actually sell the stuff, most notably Eastern Correctional Facility, which hosts a body-building competition that is covered by media. Everywhere else, the creatine is smuggled in. Usually a jar of creamer is opened by an enabling (and free) relative, the powder replaced with creatine, the jar glued back together and shipped in. Such a jar retails for $50 in the yard, which becomes an expensive proposition if you load it. But the stuff works: When I reached Eastern and began to use the stuff, I saw great gains. There are exercises done in prison that I have never seen inside a free-world gym. A tricep maneuver that’s supposedly for pecs is called a “Chestbuster,” while front-lateral-delt raises are “Heil Hitlers.” Abs are trained in bizarre ways, with men sitting in each other’s laps to weigh down the legs and isolate the muscles. The homoeroticism of this—as well as the oil rubs in the showers—is strenuously denied by the participants, as the weightlifters consider themselves only the manliest men. Since the weights are all welded together, you make adjustments to the bars with leather straps; dumbbells are tied to the ends of a bar to increase the poundage. The jumps in your lifts are extreme; the increments are at least 30 pounds. But guys manage, and since they have the time and dedication, many come out of prison in excellent form. Which they lose immediately. Having a “prison build” lasts a few months. These are not the kinds of men who join the New York Health and Racquet Club, and outside, they have other problems—poverty, unemployment, child support, addiction, and parole requirements—that keep them from their old jail-yard hobby. I have seen many a man return to prison on a parole violation and have to start all over in the weight yard. Strangely enough, it’s the barmen who keep their builds the longest. There’s an entire subculture in prison-based exercise centering on the use of the pull-up bar. The barmen figure out all kinds of gymnastic maneuvers to work different muscles, and somehow the calisthenic nature of the exercise leaves results that last longer than those of the weightlifters. I myself preferred the challenge of a heavy bar over my chest; after four years of practice, I could bench 315 pounds at the weight of 185, at least until I slipped three disks and ended my bodybuilding career. We had strapped ourselves to a slippery bar with approximately 550 pounds on it to do shrugs; I was in a hospital bed two days later. It’s part of the macho prison culture to lift weights, and to be manly and tough. Some convicts, after years of hard work, really do look imposing. At first glance, it’s understandable why a right-wing legislature might want to prevent prisoners from becoming physically stronger. But from personal experience, I can say that the discipline and dedication required by weightlifting, plus the confidence it inspires, make for a better man. Perhaps slightly vainer, too, but with at least one success under their $50 leather belts. Many prisoners are former drug addicts; many suffer from low self-esteem, the result of being poor, ignorant, and generally unsuccessful in life. The weight yards help them to see a better version of themselves, and offer them a concrete achievement in a place meant to degrade and diminish. I was released only two months ago. Unlike many a parolee, I did not emerge into the free world brimming with pecs. My injuries and my hiatus from lifting had seen to that. But I knew I had it in me. I had a confidence that comes from once witnessing extreme vascularity in a blurry mirror. That is how it worked for me, and that is why I look wistfully at every grunting, sweaty gym I pass by. 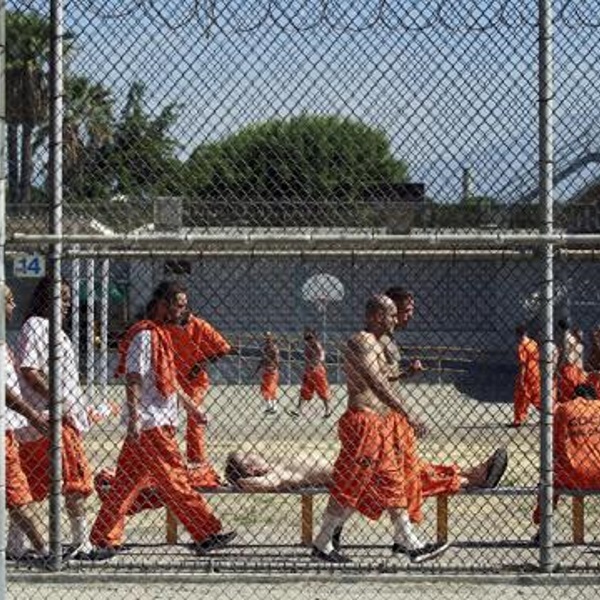 Removing the weights from state prison might make for weaker criminals, but also weaker men. And in our society, apart from the white-collar offenders, it is really the weak who commit the crimes, not the strong. Taking away the weights—and thereby killing a culture with its own customs, traditions, vocabulary, and even festivals (the annual lifting contest was much-anticipated)—would deny the men a chance for a true mens sana in corpore sano. From my own time inside, I can attest that it’s better for men to emerge from the hell of incarceration stronger—not necessarily in their biceps, but in their hearts and minds.